Nautilus is a large two-storey villa, with fantastic sea views. The top floor comprises an open-plan room with a living area, dining area and bar, kitchen, study and games room with a pool table, and a TV room that can be closed off with sliding glass doors. The master bedroom and one guest bedroom are set at the front corners of the villa, with a twin-bedded room to the rear. The lower floor houses the cosy family room, spa room, kitchenette and two guest bedrooms as well as a second terrace and four-hole putting green. 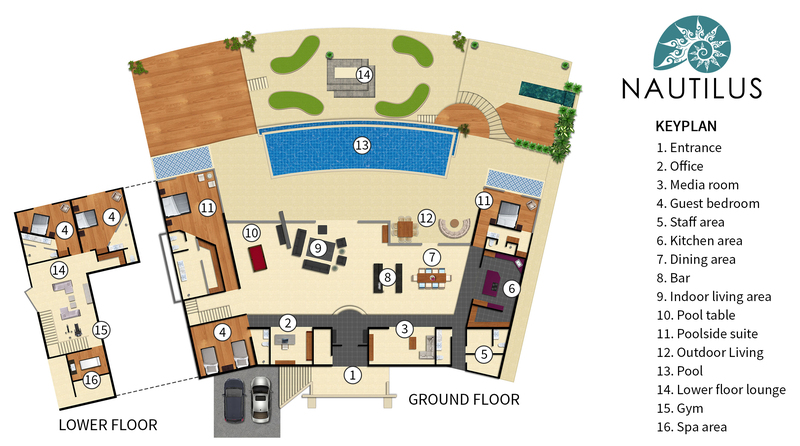 Nautilus is designed for guests to gather and relax in comfort with stylish living areas spread over two floors. Floor-to-ceiling glass doors across the front of the double-height upper floor living space offer incredible views, and slide open fully to let the sea breezes in. This open-plan area houses the main living room with a large leather sofa suite positioned to enjoy great views of the pool and sea. Next to this is a pool table in a partitioned corner, with a smaller sitting area just behind. A black-granite bar, the perfect spot for mixing evening cocktails, sits next to the dining area, which is furnished with a sleek yacht-like table for 10. A well-equipped Western kitchen adjoins the dining area, while a TV room with a soft L-shaped sofa and a study with a work desk are set to the back. Tucked away behind is the staff kitchen where the full-time chef prepares delicious meals. Another cosy place to relax is family room downstairs, with chic white chaises longues and an attached kitchenette with a stove, fridge and toaster oven. In the spa room there’s a massage bed for enjoying restorative treatments in privacy. Villa Nautilus boasts three levels of terracing connected by steps that offer fabulous views and a huge area to rest and play in the tropical outdoors. The 25-metre black-tiled infinity pool extends across the top terrace, bordered by a wooden deck lined with sun loungers and a barbecue area. A stylish round sofa set and a dining table for eight sit under shaded roof cover just outside the living-dining room. Get the golf clubs out and step down to the mezzanine level terrace, where’s there’s a four-hole putting green surrounding a sunken lounge. The two lower-floor bedrooms open to a spacious shared terrace. Ideally designed for extended families or groups, the villa’s five bedrooms are set up to offer two separate living quarters for added privacy. The master suite and two guest bedrooms are set around the top floor’s living areas, while the two bedrooms on the bottom floor open to a communal family room and kitchenette. All rooms have remote-controlled air conditioning and ceiling fans. Set at each end of the swimming pool, the master suite and a guest bedroom each offer a spacious and peaceful retreat with fantastic sea views. Both rooms have king-sized beds, two walls of windows and sliding glass doors to the pool terrace. Added comforts include cosy armchairs, ensuite bathrooms with rain showers and, in the master suite, a walk-in wardrobe. Tucked away behind the master suite is a twin-bedded room, while two large guest bedrooms downstairs, one king-bedded and one with a queen-sized bed, share a huge terrace with mountain views and easy access to the putting green. These three guest suites have ensuite bathrooms with rain showers and wardrobes.